As most long-time knitters know, there are two kinds of hard projects. There are projects that are actually difficult, involving challenging techniques, extreme precision, or lots of experience. Then, there are projects that are really more a matter of endurance than skill. 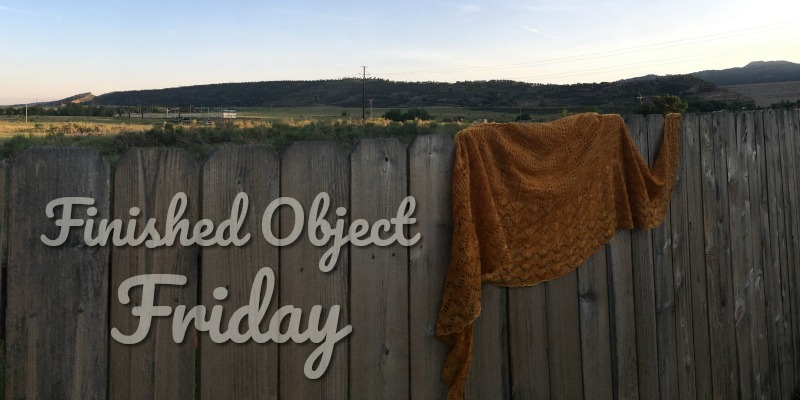 Helena’s Shawl from Interweave Knits Summer 2017 was definitely a battle of endurance. A very satisfying and fun battle—don’t get me wrong. But this project isn’t for the faint of heart. When I wrote last, I had mostly finished the twisted rib columns that start off the top-down shawl. I thought my rows were insanely long then. I had no idea what was coming. It took me almost an hour just to bind off! The horseshoe lace that came after the twisted ribs was definitely a relief, though, and I started to pick up speed until it came time to start adding the beads. I had never tried knitting with beads before, and I started out using a very small crochet hook to slide the beads onto stitches before I worked them. It worked well, but in between stitches with a bead, I lost a lot of time sliding beads onto the crochet hook, setting the hook down, and picking it back up. 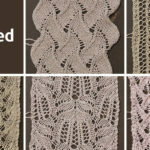 For the last repeat of the lace pattern, I tried a different method, as shown in this Interweave Yarn Hack: I used a beadle tool. As you can see, it’s a little bit fiddly, but I saved so much time by being able to load so many beads onto the tool at once. I even found that since the beadle tool was so thin and light, I didn’t always have to put it down in between beads. I will admit that by the time I finished casting off, I was way too close to the shawl and really ready to be done. My sense of wonder was restored, however, by the blocking process. I had never knitted a lace shawl before the Helena’s Shawl and I simply wasn’t prepared for the transformation that would happen as soon as water met yarn. It was incredible to watch both shawl and lace take shape before my eyes. Now that the shawl is finished, I love wearing it with a dress, or even to dress up a t-shirt! I recently wore it to see a play at the Colorado Shakespeare Festival, which was exciting because the whole magazine is Shakespeare-themed! Unfortunately we weren’t seeing A Midsummer Night’s Dream, the story Helena’s shawl is based on, but it was a very spooky version of Hamlet in a very chilly theater, so the shawl was much appreciated. I decided to use Malabrigo 100% wool laceweight, a very different yarn from The Fibre Co. Road to China used in the magazine sample. My shawl does a wonderful job of keeping the chill off my skin without heating me up too much. I was also incredibly pleased with the way the yarns colors subtly pooled in curved swirls along the shawl’s rows. I’m considering adding some tassels to this shawl to give it a little bit more of a boho vibe. What do you think? Let me know in the comments! 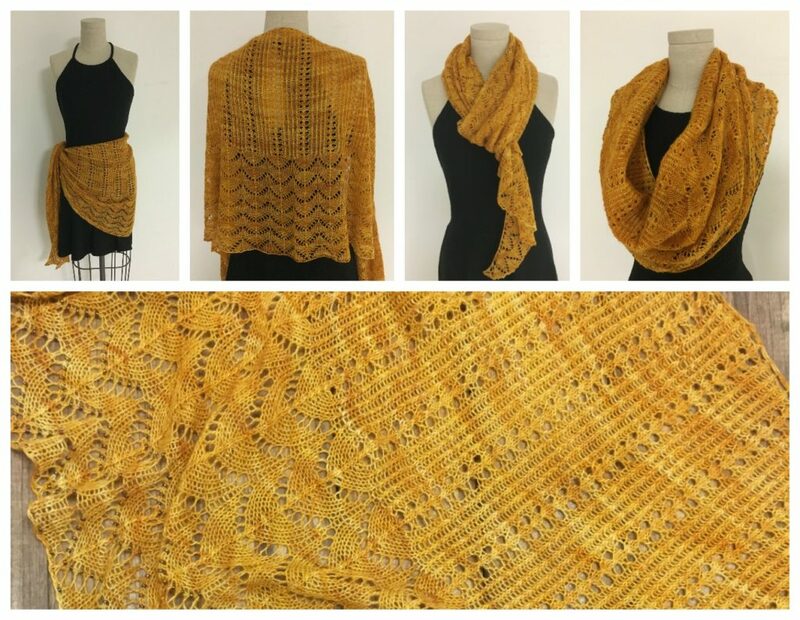 Want to Knit Your Own Helena’s Shawl? Finished Size 77.5” wide and 23.5” tall. Yarn The Fibre Co. Road to China Lace (65% baby alpaca, 15% silk, 10% camel, 10% cashmere): grey pearl, 2 skeins. Yarn distributed by Kelbourne Woolens. Needles Size 5 (3.75 mm): 32” circular. Adjust needle size if necessary to obtain the correct gauge. Notions Size 14 (0.8 mm) steel crochet hook; 1246 Delica size 8 beads; tapestry needle. Gauge 24 sts and 32 rows = 4” in twisted rib lace patt; 22 sts and 28 rows = 4” in horseshoe lace patt. If your heart desires tassles, let it have tassles! I think they would make an excellent addition, and you can always remove them later if your heart drifts in another direction. I recently finished my first wrap with added beading. I tried to do one last summer and decided I flunked. The yarn was way too fine silk. I tried again this year with a cotton blend yarn and a Mindi Ross fun pattern. It worked up much better, and yes, I did enjoy the wet blocking process. It was a good lesson for me to hang in there and maybe try different tools. I really do like your lovely golden wrap. It looks wonderful over the simple black dress. Now, I am trying to learn to spin.